It can be assumed that we are all aware of the major role we play in educating our children. In their search of guidance, they often look up to us and try to copy our example and our moral values. Issues like diet, health, as well as personal and oral hygiene are often related to an attitude which develops early in life and is profoundly influenced by the parents, who themselves are being bombarded nowadays by an endless flow of information and advertising, most of them contradictory. Responsible parents, therefore, should acquire a basic knowledge on health issues, if they are to protect, educate and raise their children along safe and unbiased guidelines. 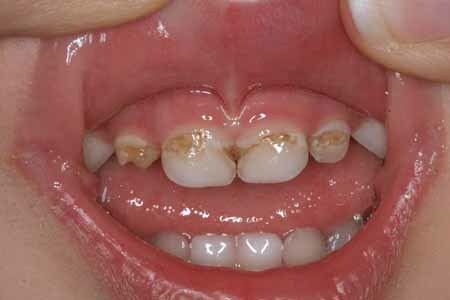 When does our responsibility start regarding the teeth of our children? BEFORE BIRTH! A healthy, stress-free pregnancy with adequate vitamins, minerals and organic foods will nourish the growing fetus and its tooth buds, which start calcifying within the jawbones already by the fourth month of pregnancy. This is also a good time to catch up on reading and preparing to take on new responsibilities. A word of caution: mercury circulating in the mother’s blood will actively accumulate in the fetus through the placenta. Therefore, during your pregnancy, and during the nursing period after giving birth, avoid any dental treatment, certainly those involving amalgam placement or replacement. When is the right time to start brushing? Preparations for brushing should start even before teeth erupt at 4-8 months. Rubber-tipped “toothbrushes” can be used to massage the gums to relieve the discomfort and itching associated with the teeth erupting, and to stimulate blood circulation. You should brush their teeth regularly as soon as they erupt. The baby will then realize that brushing is an important routine just like nappy changing. With a little imagination, games and stories may be associated with brushing to make it more fun. By 3, a child should already manage simple brushing strokes on its own. As more teeth erupt, the parents should start flossing their teeth, in particular those teeth which are in tight contact . How can we keep children away from decay – causing foods? Never let your baby fall asleep with a bottle in the mouth. Milk, sweetened or acidic drinks will pool around the teeth and cause them to decay very fast. Children naturally have an instinct for eating simple, nutritious and vital foods. However, soon enough they are exposed to the colorful world of decay-causing sticky sweets and processed foods which give them more calories and less nutrients, all in a lifeless form. They are reprogrammed to demand more quantity and variety. Heavily sweetened sodas replace water, and constant, unhealthy snacks replace the nutritious meal. Today it is impossible to ban the child from having sweets and candy, but you can negotiate and compromise. Do not brush teeth right after sour or acidic drinks. Just rinse. Nibbling on a piece of hard (non-creamy) cheese (preferably sheep or goat or tofu) will re-calcify the child’s teeth. Hard and chewy natural foods are important in stimulating the child to chew and produce saliva – along with the IgA antibodies present in it – as well as stimulate and massage the gums, and provide a self-cleansing action for the teeth. Since baby teeth will be replaced, is it all right to ignore cavities in them? They are important spaceholders for the incoming permanent teeth and should be kept as healthy and as long as possible. If they get abscessed, they not only cause unnecessary pain and psychological trauma, but they could also damage the underlying developing permanent tooth. NOTE: LASER DENTISTRY is very appealing to kids and can be used to replace the drill and solve many fear issues. After all, it is the ultimate rewarding experience to see your child walk out of the dental office with a large smile and a feeling of positive accomplishment. Check out our website (sarkissiandds.com) to find out more. When should we take the children to the dentist? If you wait until the child has toothache, IT WILL BE TOO LATE! The treatment of a neglected cavity almost always involves some pain, and if it is associated with the first ever dental visit, it will create a deep psychological fear in the child. A child should accompany the parents to the dental office starting as early as one year of age to familiarize itself with the dentist, the office environment, and the dental instruments and procedures (as long as they are painless and in a relaxed atmosphere). Later, procedures such as polishing and filling small cavities will be tolerated and luckily the child will never develop a long-standing fear of dentists. They suffer a blow to the front teeth (even with no apparent harm). Any extraordinary swelling, color change, or obscure pain appears within the mouth or on the face/neck area. Permanent teeth fail to erupt for more than 2 months after shedding the baby teeth, or baby teeth fail to drop within 6 months of their time. Is it OK if the child is “put to sleep” to receive treatment? If properly carried out, the incidence of a life-threatening event during i.v. sedation is not so much higher than the administration of local anesthetics. The level of anesthesia is not so deep in dentistry. Breathing is not suppressed, and the child will come to within 5-10 minutes after completion of the procedure. The cumulative load of local anesthetics injected over countless appointments may turn out to be more toxic to the liver than a single load of I.v. anesthesia. The discomfort, fear and anxiety involved with such involved procedures including possible pulpotomies or root canals simply cannot be avoided. 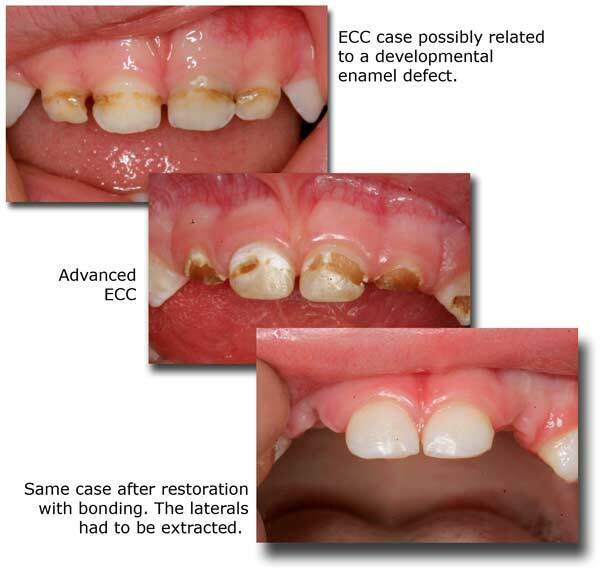 The quality of work, particularly of such a nature as pulpotomies, bonded white restorations and metal-free primary tooth crowns can be significantly superior when performed under full anesthesia. When is the time to consider orthodontics for a child? A child’s face and skeleton follows a particular and complicated growth pattern, influenced by hereditary, environmental and functional factors. Any aberration of either of these factors will influence the growth pattern and will cause a disharmony. Many problems are a result of a discrepancy between tooth size and jaw size, which eventually lead to crowding. Allergies, deviated nose septums, hypertrophic adenoids and tonsils all cause mouth breathing, which start a cascade of skeletal facial anomalies such as retrognathic jaws, compressed dental arches and tongue thrust. Such growth patterns in turn lead to more serious airway deficiencies and sleep apnea. Other reasons are premature loss of a baby tooth, thumb-sucking habits, or tongue/lip dysfunctions including wrong swallowing patterns. 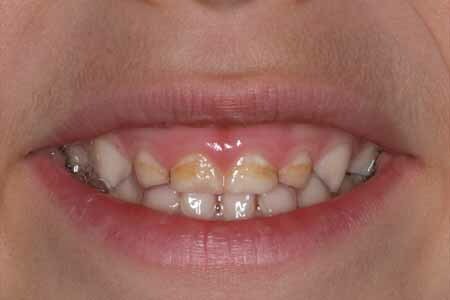 Orthodontic evaluation and possible interceptive treatment of a child should begin at age 4. A sound orthodontic approach should always include influencing the natural craniofacial growth patterns with removable or functional appliances. Arch development using appliances at an early age, before the baby molars are replaced, is essential in your child having the necessary space to accommodate all the permanent teeth. Fixed braces and tooth extractions in many cases become unnecessary if this phase is successfully followed through. To find out more on appliance therapy, peruse this website. Please see also Dr. Sarkissian’s website about Functional Jaw Orthopedics. Important: Mouth breathing has the worst consequences. Address all causes (allergies, habits, adenoids) as soon as possible so lip closure and nose breathing resume.